Today in this article I will guide you on How To Install TWRP Recovery On Any Android Phone Without Root. Using TWRP Custom Recovery you can install any custom ROM, take an android backup, install ported apps, install the kernel and so much more. This is the official method to install twrp recovery on any android device. Below I have shown you step by step method to Install TWRP Custom Recovery On Any Android Phone, This process does not require PC/Laptop you can easily install Custom Recovery On Any Android Device. But make sure to follow each and every step shown below to successfully install custom twrp recovery on your android phone. After you successfully installed twrp custom recovery you will be easily able to flash custom ROMs without any requirement of pc/ laptop. You can root your phone by Installing TWRP Custom Recovery. You must keep in mind while installing twrp custom recovery on your phone is installing twrp recovery can brick your device if you have not flash the file properly. It is always recommended while flashing any file make sure to take a complete backup of your android. First Download the Android SDK Platform Tools (Depending Upon your operating system download the one that suits you). As I am a Windows user I will Install Windows Android SDK Platform Tools. This tools sizes around 7 MB. Now you need to download TWRP Files. Just click on this link TeamWin – TWRP it will take you to TeamWin – TWRP Website. There you will find the List of devices. Now search for your Model Number For Your Phone. Go to your device and there you will find the Download Links (Choose the latest TWRP Image) and download it. First of all extract the “Android SDK Platform Tools”. Move TWRP.img File to “Android SDK Platform Tools” Folder. Go to “Settings” >> About Phone >> There you will see “Build Number” Tap it 7-8 Times to Enable Developer Options. After that Go to “Developer Options” Scroll down and Enable “USB Debugging”. Now “Connect Your Phone To PC” >> After you Connect Your Phone To PC you will see a pop-up message in your phone. Just Tap On “Always Allow This Computer” and Hit Ok.
Now Go to the Folder Again that you just recently opened (Platform Tools) >> Here you have to open a command window, To open a command window Click On [Shift Button] and [Right Click] On The Mouse Button and there you will find an option to Open Command Window. Now Type [ fastboot flash recovery <Enter The File Name Of TWRP Image File>] Hit Enter. Now Again Type [ fastboot boot <Enter Recovery File Name>] Hit Enter. You have successfully Install TWRP Custom Recovery On Your Android Phone Without Root. Now you can flash custom ROMs, flash a custom kernel, install ported apps, boot your device. You can do everything whatever you want. So, that’s the easiest way to Install TWRP Recovery On Any Android Phone Without. 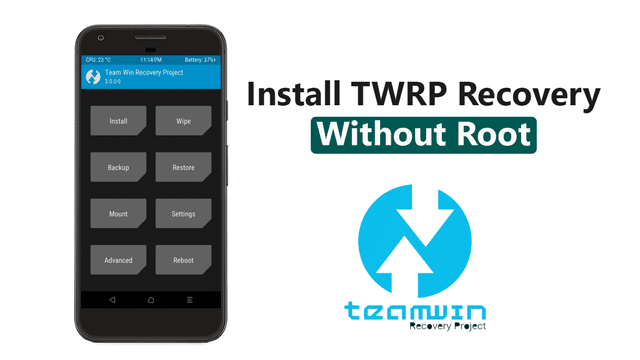 If you want to ask any questions related to Installing TWRP Recovery On Any Android Device Without Root then make sure to comment down below. We would like to hear from you!